Original scan had lots of snow on the umbrella, and her entire sleave was covered in very decorative words T.T Took forever getting rid of that >< Anyways, this is the outcome, so i hope u like it! hours: um.... a lot ^^'' worked mostly all day yesterday to finish it. Browse Hitohira Meguri Gallery: Recent | Popular. the girl is very cute and the background is beautiful.thx for sharing. i love the scan and the background is so awesome and it just fits so well!!! this is so good! :) the girls so kawaii and the bg suits her :) nice nice job! You did an excellent job of cleaning everything up, and the background looks amazing. 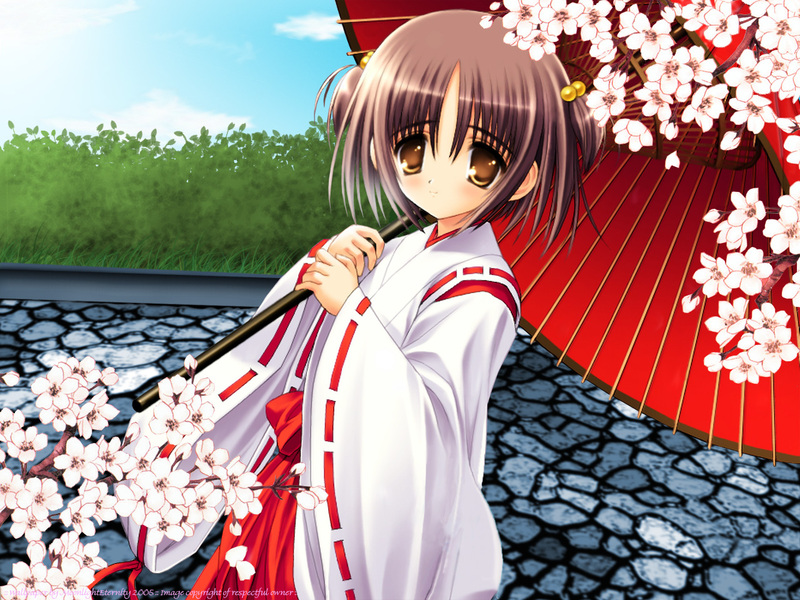 The only thing is that the sakura blossoms just don't seem to fit with the rest of the image. Or maybe that's just me. :P Anyway, fantastic job! You're back!!! XD I likes alot but I think my eyes are doing it...the pavement between the girl and her umbrella seem to be going in a different direction than the rest....which is kinda weird, but it may be my eyes playing tricks...XD Good wallie!
. : This is a nice wallpaper, the scan is very very pretty, the bg isn't horrible, it's just not as worked out as many other wallpapers of yours, it´s a simple bg and the flowers give it much life and they fit the character very well...heven if it's not shinny like some others u made i like it alot :) ...favs.:. Yey.....What we have here....Waiii!!! This girl looks really pretty!!! Ohhh...and sakura flowers!!! :D Gotta love it!!! Beautiful work!!! Pretty flowers and cute girl ^^ Everything looks great. Keep it up! o wow! XD what a beautiful wallie! the colours, the girl and the name! everything is so nice!!! i like it a lot! PErfect colors.... Good work in PS cs..... Use the CS2, its more simple. Welcome back! Wow, this is a cool wallpaper! I like the tiles on the ground most. Good job and keep up the great work! Wah....welcome back...!!! hehe...now can see more of your work...hehe...i like this one but i just find the granite or stone flooring..well doesn't seem to fit in...not sure why...could be cause it's too bold??? very cute and pretty wally. hm.. there's seems to be something missing in the bg, but can't point out the problem. It's still a nice wallpaper. o_0 this wallie is sooo nice.. it's not terrible or horrible MoonlightEternity..
and you spent whole day doing it~~ i must say that it is really fantastic..
super bg and great character!! keep it up!! Awww, that's really pretty. ^_^ I love the stone walkway she's on, it looks really well done. :) The flowers are really pretty too. Nice job!